Fiberglass planters are attractive, versatile, and cost-effective. They have the natural look of stone, concrete, or terracotta and are available in a variety of styles and finishes. Fiberglass containers display tropical plants beautifully in both indoor and outdoor locations. Fiberglass Plant Containers – What Are The Advantages? Unique finishes simulate the look of natural materials (stone, concrete, terracotta, iron) without the heavy weight. The molds used to make these plant containers allow manufacturers to create unique surface patterns and textures. Their light weight makes these planters easy to move from one location from another. Fiberglass is a durable material that requires minimal care and will last for many years to come. Fiberglass garden planters are durable and will last for many years. 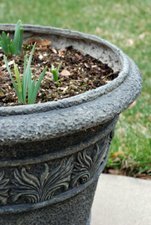 Take a little extra time when choosing this type of plant container because you will more than likely replace it due to making a bad choice, not because of wear and tear. Decide what the planter will hold. A tree or shrub will require a sturdier container than a light, leafy plant. Remember, fiberglass is a lightweight material. Determine the location. Fiberglass planters look great both indoors and outdoors. Choose a finish and/or texture. Fiberglass planters are available in a variety of finishes that simulate natural materials (stone, concrete, terracotta, iron). Textures available include glossy, matte, and crackle. Caring for planters properly will keep plants healthy and ensure the container is structurally sound. Fiberglass containers are durable and require minimal care. Re-pot plants if necessary. Expanding roots could cause cracks in the planter. Fiberglass is non-porous. Proper drainage is important for plant health, so be sure the container has a drainage hole. Protect smaller planters from heavy winds. Bring them inside during harsh weather.